Tennis shoes aren’t just designed for the players of the said sport; they can also be utilized in other fields for the same purpose – giving your feet the comfort it deserves. For instance, a professional nurse who needs to walk around the hospital for long hours must have a footwear capable of aiding his feet with the support it requires. When helping in a surgery, a nurse inevitably stands in the operating room for extended periods. This is why it’s crucial to have the proper shoes. So here are the best tennis shoes for standing all day. Tennis shoes are one of the most robust shoe types; they are especially designed to withstand movements that require agility and speed. Though basketball shoes could easily fit in that category, it lacks one thing that tennis shoes possess – being lightweight. This is what makes tennis shoes ideal for people whose jobs require them to stand most of the time. Standing for long periods could easily become a burden to all people. Who wouldn’t get tired from standing all day? With this in mind, you need something that could support your feet from the damages and effects of standing. Apart from standing, the shoes must also be good enough to make you comfortable when walking and moving around. Tennis shoes are the ideal type because of their distinct design that adheres to the demands of your work. Having one means you have a versatile pair you can use not just for work, but also for doing activities that it’s primarily designed to – tennis. Now you can work and play with just a single pair of shoes. It also means that you can save big-time because you won’t need to buy another pair for a different field. You also don’t need to worry about compromising your professionalism because with the right shoes, you can still look professional in your uniform. 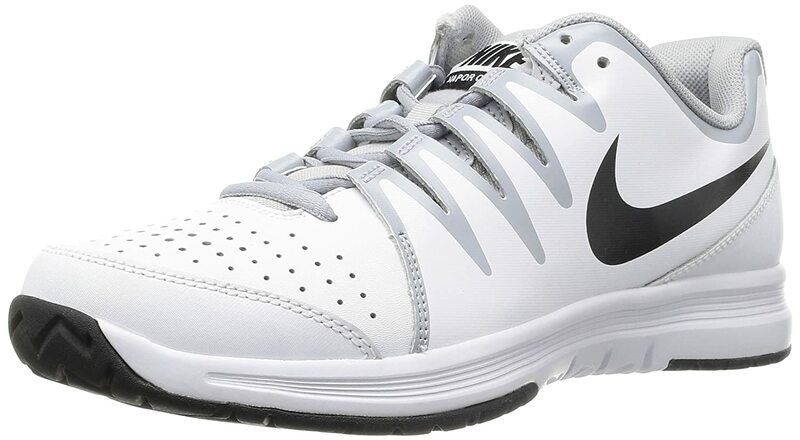 An evolution from the Vapor 9 Tour, The Nike Men’s Vapor Court Shoe is probably the answer to your search for the comfortable tennis shoes for standing all day. You’ll like the locked-down feel of the Dynamic Fit technology it features as it gives you a secure fit without feeling cumbersome. Coming in white and black, the Nike Men’s Vapor are highly affordable with lots of benefits. The shoe construction is perfectly conventional: rubber outsole, fabric lining, and manmade leather upper. Though it looks quite standard, these shoes still boast a durable build. Contrary to how it looks, this model is actually lightweight. This means it can easily compete with most lightweight shoes in the market. Standing all day won’t be much of a burden anymore. You can also enjoy soft cushioning brought about by the full-length Phylon midsole. Walking on slippery tiles won’t seem like a threat anymore thanks to the flex grooves that offer a stable range of motion. Durability in high-wear areas is also ensured by the Omni traction – another proud feature of this model. The padded foot-bed contributes is great for added comfort. Overall, the Nike Men’s Vapor are shoes that tend to “hug your feet and at the same time, have a good arch support.” For its price range, the shoes represent outstanding value for money. “Easy on your feet but hard on your enemies.” The Adidas Performance Men’s Barricade Court 2 Tennis Shoe are shoes you can count on. This model is an improvement on the previous Adidas line-up of the same series. The synthetic upper features a design update improving breathability through the breathable mesh underlays. The synthetic uppers can help control moisture inside the shoes meaning you won’t sweat even if you wear the shoes consistently for hours without taking them off. 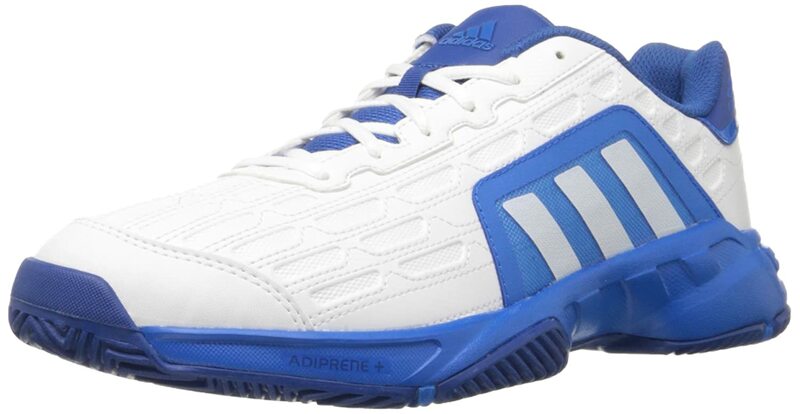 Adidas is also proud of their Adiprene+ cushioning which is basically an enhanced cushion design. The rubber outsole is also stylish with bold block coloring. What makes these shoes even more appealing is the wide array of 6 color options you can choose from. Best tennis shoes for standing all day. The forefoot is designed to respond easily to sudden movements. The flexible synthetic upper helps with agility. Though this may be an ‘improved’ Barricade shoes, its lower price (compared to other shoes in the same series) means that it doesn’t have all the features that the more expensive ones possess. This model is ideal, though, for people who have jobs requiring them to stand up for long periods. The edge of the Barricade Court is that at only 11.6 ounces it’s incredibly lightweight. When you are standing for hours on end, wearing shoes like this makes all the difference. Heavy on performance. Light on weight. These are the lightest shoes on our list. These ASICS GEL-Solution Slam 3 weigh a mere 8.1 ounces. Made with a woman’s feet in mind, this model features torsional stability along with enhanced cushioning for added comfort. The secret behind these features is the low-profile midsole. This model features an exclusive midsole material that decreases midsole breakdown while enhancing bounce-back capabilities. You can feel its quality with every step, quick or slow. It’s like the shoes itself helps your foot to lift up after each step. Furthermore, the Forefoot GEL Cushioning System helps during propulsion by improving shock reduction. ASICS have a long brand heritage for producing sports shoes that deliver. Added comfort is brought by the heel collar and padded tongue. If you’re looking for shoes that don’t have a lace, then these laced tennis shoes are not for you. One of the biggest factors of the weightlessness of this model is the Trusstic System technology present in the outsole. This is responsible for reducing the weight of the sole unit without negatively affecting the integrity of the shoe’s construction. 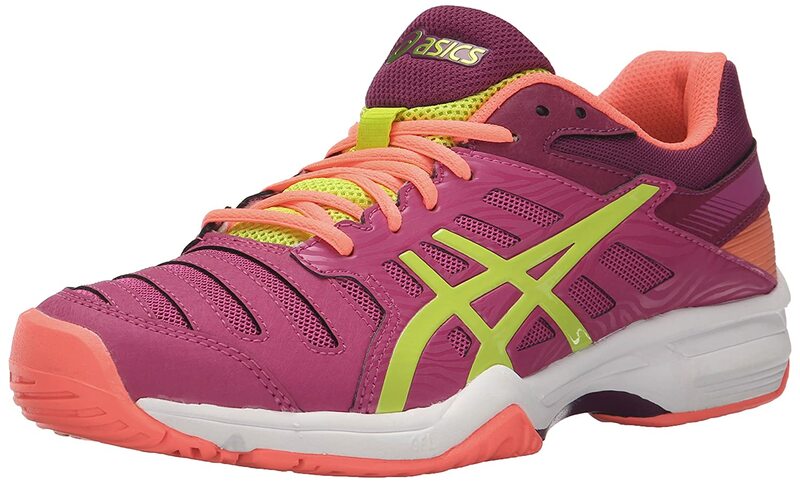 Overall, the ASICS GEL-Solution Slam 3 is the ideal solution for any woman looking for shoes to help them stand all day. With high abrasion rubber placed strategically in particular areas in the outsole, you can expect reliable shoes that will withstand the heaviest demands. These are very strong candidates for the best tennis shoes for standing all day. Hi, I’m Evelyn – the owner of Footwind with a few years of writing to share my knowledge about foot’s issues as well as review many foot care products (shoes, socks, sandals, insoles…) and other health tips. I want my articles widely shared with some who are struggling to overcome. Warmly welcome all! © Copyright by Foot Wind 2016-2018. All Rights Reserved.